Description Amplify the grandeur of your home dÃ©cor with this polyester shag area rug which is fabricated in the combination of vivid eye-catching colors. This handmade shag area rug is designed by the seasoned weavers using the best quality material to ensure its resilience to wear & tear and impeccable finish. It needs negligible maintenance. rug is nice but the colors are a bit brighter than they appeared online. I bought this in 10x14 for great room. Very pretty colors of turquoise, gold, black, some grey. , pretty true as shown.Gives me color and do not think it will show dirt. Nice for the price. Hope this helps. Wish all reviewers would describe colors and colors used with!! This rug is absolutely beautiful. The colors are true to the pictures. It arrived very quickly and it was packaged well. I would purchase again from this website. I ordered three of these rugs and they arrived on time and were very well packaged. When I opened the package I was delighted to find them exactly as pictured on the website and they seem to be good quality. 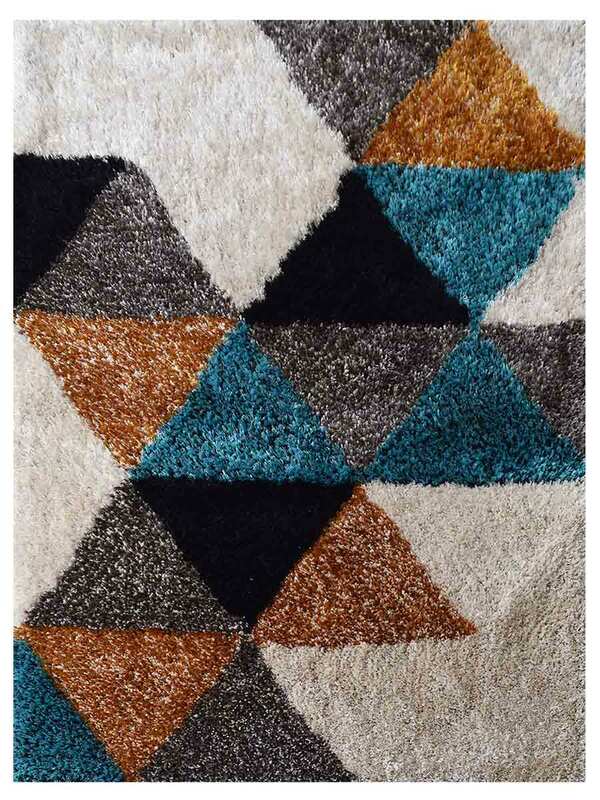 I am very happy with them and would have no hesitation to order from Get My Rugs again. I bought off this size and a larger 8x10 version of the same design. We will use it in the out door bedroom area upstairs. The rug is of very high quality and the colors are gorgeous - exactly as expected. This was my first buying experience with getmyrugs and so when I saw the prices I was a little apprehensive, could I get a good quality rug for such a great price? Yes! I got 2 rugs in fact and love them. Everyone has commented on how nice they look. Thank you for the great find! Wow! I am in love with our new rug. The colors are gorgeous! The rug has a soft thick pile. Put this in our reading room for my kiddos. It adds a great pop of color over our wood floors and for our oak stained book shelves. I bought this rug for our cabin because I like the rustic/modern feel. Needless to say it looks perfect!!! This shipping is amazing too! Great colors and the texture! The rugs are fine. I wish they made rugs that were not so thick. Also, they take forever for the ends to flatten out. But they are good rugs for the price. I've had this rug in my home for about 5 days now. It arrived a day earlier than expected which was great. The is beautiful and exactly what I expected. The pictures the company provides for the rug show exactly how the rug looks. The size was on point too. I like it, but the colors are a bit more subdued than shown. This rug spiced up my living room. I highly recommend it. I’m a real look, touch and feel shopper. Buying a rug and trusting the texture and colors was difficult. I’m so happy with this rug purchase. The colors are just like the picture and it fits my decor beautifully. Good quality and won’t show wear. Very happy with this purchase. BEAUTIFUL COLORATION AND THICK INDIVIDUALY TUFTED PIECES MAKE THIS RUG A MASTERPIECE OF ART. The rug is beautiful, just like the picture. Put it in my husband's bathroom and it looks great., colors like the picture on the site. Colors are very vivid and beautiful. The feel is very soft and plush! Not a plush rug but perfectly priced for an (old) animal lover. ;) Colors are just as pictured, very vibrant and decently made. Disappointed. Rug is not as vibrant as pictured. Not being vibrant makes it look darker, less contemporary. So this rug is absolutely beautiful. When I opened it, I was initially disappointed that it was not as bright as the picture on the website portrays. However, Not too bright and not too dull! Rug is exacactly soft to feet walking on barefoot. Modernizes my living room. Prompt service, and great price. Delivery was late.